Faced with an itchy young head full of nits, it's all too easy to reach for a bottle of potent chemicals. But is smothering your child's hair in pesticides really the best solution? Of the common childhood disorders, few are met with such revulsion in adults as head lice (Pediculus hummus capitis), or nits. They are an increasing menace in schools, and some parents are so squeamish about them that they can hardly bring themselves to treat the problem. Many take it as a comment on their own standards of hygiene if their child becomes infested but in reality hygiene, or at least cleanliness, rarely has anything to do with it head lice. Nits are parasites that live in the hair and scalp, and need human blood to survive. Spread through direct contact, they can infest anyone, regardless of how 'clean' they are. In fact, clean, grease-free hair that hasn't been treated with artificial chemicals or stripped of its natural oils is easier for nits to grab hold of. In fact, nits are head-lice eggs. They are attached firmly to the hair shaft and are often mistaken for dandruff. They are oval and usually yellow to white in colour. 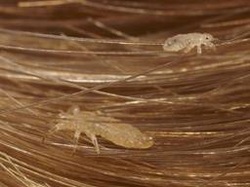 The nits hatch into nymphs or immature-adult head lice in about seven days. On reaching maturity, adult lice can live up to 30 days on a person's head and lay up to 100 eggs a month. An adult louse is about the size of a sesame seed, has six legs and is tan to greyish-white, but will look darker in dark hair. Infestation with head lice is a very common problem in the UK, especially among school children. The lice cannot fly or jump or hop. Instead they transfer to from one head to another by walking along strands of hair. The lice pass from one person to another during direct head-to-head contact so children whispering secrets at school or families enjoying a cuddle at home provide head lice with head-to-head contact necessary to allow them to travel from one head to another. In the UK, four pesticides are used to treat head lice; regulatory authorities and some medical scientists believe they are 'safe', though this belief is hotly disputed. Carbaryl has been available by prescription only for more than a decade, since studies found it caused cancer when given to rats in large doses throughout their lives. It is generally considered a last resort treatment for stubborn cases of infestation. Over the counter you can buy products that contain the organophosphate insecticide malathion (Derbac-M liquid, Prioderm cream shampoo, Prioderm lotion, Quellada-M cream shampoo and Quellada-M liquid); permethrin (Lyclear Creme Rinse) and phenothrin (Full Marks liquid and lotion). Malathion is the same stuff used for sheep dip. Like carbaryl it works by blocking an enzyme called cholinesterase. In humans this can cause such side effects as headache, nausea, paralysis, chest pain, muscular twitch, blurred vision, cramps, giddiness, impaired memory and disorientation, dizziness, tremulousness and hallucinations. Chronic exposure has been linked to chronic fatigue and fibromyalgia. These serious long-term reactions are most common in people who have been exposed to these pesticides over the long-term, such as farmers. But, given their high toxicity and children's greater sensitivity to toxic chemicals, it is appropriate to question their use as occasionally head lice treatments too. Permethrin and phenothrin are pyrethroid insecticides. Permethrins are irritating to the skin and eyes and can also worsen allergies and asthma. Human studies are scarce, but animal studies suggest they can suppress the immune system and be toxic to the liver. This type of pesticide is implicated in Gulf War veterans' disabilities. Pregnant and breastfeeding women should not use permethrins, and they are likely to have a greater toxic effect in young children. For a comprehensive review on permethrin see this link. There is strong evidence that licensed treatments claiming to kill lice and nits in a single application don't. Over the years, head lice have developed treatment resistance, leading to the formulation of ever stronger mixtures. What is more, most chemical treatments don't kill the eggs, which then go on to hatch within a week or so, starting a whole new cycle of infestation. Repeated treatments and the use of one pesticide treatment after another on the same child has also become more common. As a result, many parents report that conventional treatments give their children acute headaches. Others, including parents, experience rashes and more severe allergic reactions from using them. Products such as Hedrin lotion, Itax lotion and NYDA pump spray contain either dimethicone or cyclomethicone.Because they are film formers, silicones are associated with skin irritation. Silicone-based products work in a different way to conventional insecticides, and in fact it is their film forming ability that makes them effective against lice. Instead of paralysing their central nervous systems they kill the lice by physically coating their bodies and suffocating them. Because of the way these products work, head lice cannot become resistant to silicones. The problem is silicone-based lotions don't kill eggs, so you need to repeat treatment after seven days to kill any lice that have hatched from eggs since the first application. At the more natural end of the scale there are now many so-called non-toxic products on the market which makes use of natural essential oils such as tea tree and neem and which are either simple ‘wash and go' type shampoos or leave-in treatments. These may make removing eggs easier but they don't kill eggs either so treatments need to be repeated until all eggs and lice are gone from the hair. Some shampoo-in treatments, even the ‘natural' ones contain all the usual harsh ingredients that this column has criticised in the past, such as sodium lauryl sulphate (SLS, a harsh cleanser often used as an engine de-greaser which is irritating to skin and mucous membranes) and cocamide DEA (irritating the skin; belongs to a family of fatty acids called alkanolamines, which are considered hormone-disrupters). Apart from silicones, leave-in solutions can contain triethanolamine (a skin and eye irritant and suspected hormone-disrupter), propylene glycol (irritating to eyes, skin and respiratory tract and a penetration enhancer, altering skin structure, allowing other more toxic chemicals to penetrate more deeply into the skin and eventually the bloodstream). Many contain the whole range of hormone disrupting parabens preservatives: methyl-, butyl-, ethyl- and propyl-paraben. In truth, neither the conventional synthetic pesticides nor the 'natural' alternatives that are currently in use are fully effective against head lice and their eggs. In other words there is nothing you can simply spray or rub into your child's head that will do the job for you so that you won't have to get too up close and personal with your child's lice. The best way to see if your child is infested is to look and if you find your child has nits, manually removing them is just one of those little jobs that as a parent you simply have to face up to. Nits are easiest to see because they are 'glued' to the hair shaft. Nymphs and adults are harder to find, and can move quickly away from searching eyes and fingers. Ultimately, it's not the 'stuff' you put on the hair, but how conscientious you are at combing it out afterwards that will really win the day against head lice. As children flock back to school, the annual plague of head lice lurks beyond the classroom doors. The vile creatures don’t spread disease but can be a severe nuisance for teachers and families. The vermin are estimated to afflict between 6 million and 12 million young children in the U.S. each year and parents generally turn to a variety of pesticide-based shampoos and treatments for relief. Parents often aren’t aware that some of the most prescribed and over-the-counter treatments can be harmful to children, an iWatch News investigation found. The Food and Drug Administration’s adverse event reports – collected anonymously from doctors, hospitals and others – detail cases where the pesticides in lice treatments have been involved in conditions ranging from headaches to death. The reports were obtained under the Freedom of Information Act. One of the biggest worries for some health experts is a prescription treatment for head lice and scabies called lindane. The pesticide has been targeted for worldwide phase-out since 2009 by the Stockholm Convention, a global treaty that targets some of the world’s deadliest toxins. The U.S. has not ratified the treaty , and has no imminent plans to ban lindane for head lice. Since 2006, lindane can no longer be used here on crops or cattle, or for any other purpose regulated by the Environmental Protection Agency. A so-called “second line” treatment – meaning it’s only to be used if other methods fail – for head lice and scabies, lindane has been linked to cancer, seizures and deaths, according to the FDA. Lindane accounted for $10.5 million in U.S. sales in 2010 for head lice and scabies, according to IMS Health, a healthcare information company. Pesticides called permethrin and malathion can also be problematic for lice treatment. Permethrin is found in popular over-the-counter products, such as Nix. Malathion and lindane generally require a prescription for drugs that go by the names Ovide or Kwell, respectively. Nix, along with other products, has been approved for use on children as young as two months old. Jerry Jabbour, vice president and general counsel at Wockhardt USA, whose subsidiary manufactures lindane, said that the U.S. is not bound by the Stockholm Convention, and that many of the more problematic issues with lindane have been linked to agricultural uses and the pesticide’s inability to be broken down naturally in the environment. Robyn Ungar, a spokeswoman for Insight Pharmaceuticals, which manufactures Nix, said the product hasn’t been directly linked to problems associated with the pesticide. But health experts are concerned about recent studies that show the shampoos are less effective than they used to be as lice become increasingly resistant. That can often mean parents are shampooing their children again and again – a dangerous practice, especially if parents ignore strict time limits between treatments. Even though many doctors consider the pesticides safe in low doses, advocates say that many pediatricians wouldn’t recognize the signs if something did go wrong. “It’s one things to spray pesticides on broccoli to kill bugs, but when did it come about to put it on children to kill bugs?” Calwell asked. Malathion has been linked to seizures and other health problems. A 2007 study said there is “some association” between pesticide exposure and childhood cancer, while other reports have shown children are more susceptible to problems with malathion than adults. Permethrin, another pesticide often combined with other chemicals and contained in both over-the-counter and prescription shampoos and lotions, has similar neurotoxic properties that have some experts questioning whether it should be applied to a child’s head. Richard Clapp , an environmental health expert and professor emeritus at Boston University, said each compound can produce problems. Malathion, a neurotoxic chemical, can cause weakness and tingling in arms and legs, as well as seizures, Clapp said. Permethrin, especially when combined with other problematic chemicals, can cause seizures and, down the road, behavioral problems. In a 2009 memo, the EPA classified permethrin as “likely to be carcinogenic to humans” in some conditions. “My kids are grown up now, but I would tell them not to put [pesticides] near their kids,” Clapp said. Many pediatricians consider the compounds safe in low doses – problems generally arise when they are overused or directions aren’t followed. But some health experts argue putting a pesticide on a child’s head to treat pests that are relatively harmless is overkill in itself and could cause unattributed problems down the road. Crawling critters School was about to start last August and a pregnant Monica Tienda was desperate to get rid of the crawling lice on her 7-year-old daughter Chelsea’s head. Over several months, Tienda bought every over-the-counter product she could find, spending more than $1,000. None worked. Tienda said she wasn’t aware that any of the products she used were pesticides, or what chemicals were in them. She said none of the products worked and she eventually spent the time necessary to comb “thousands” of lice out of Chelsea’s head. Tienda’s obsession with ridding her child of head lice isn’t unusual. The market for head lice products and services is growing. Sales of the most popular over-the-counter shampoos and other treatments amounted to nearly $75 million in 2010, according to data compiled by SymphonyIRI group, a Chicago-based marketing research firm. That’s up from $67 million in 2009. (The data exclude sales from Wal-Mart and other “club” stores, as well as gas stations and convenience stores.) Sales of prescription treatments, such as malathion and lindane, totaled nearly $74 million in 2010, according to IMS Health. With the exception of lindane-based prescriptions, there is little recognition of the concerns with the pesticides on the products’ labels. Ovide, which contains malathion, has a product insert that includes warnings for pregnant or nursing mothers. But under “adverse reactions,” it states: “Malathion has been shown to be irritating to the skin and scalp. Accidental contact with the eyes can result in mild conjunctivitis. It is not known if OVIDE Lotion has the potential to cause contact allergic sensitization.” It also notes that malathion is highly flammable. Stephen Manzano, associate general counsel with Taro Pharmaceuticals, which makes Ovide, said malathion has been proven safe in low doses. He said the product has fully complied with FDA regulations, is FDA approved, and the company has not received reports of serious problems with the product. FDA complaints Through its Adverse Event Reporting System, the FDA received about 200 complaints relating to lindane, malathion and permethrin from January 2005 through October 2010. Lindane-related products were allegedly involved in 10 deaths; permethrin was listed in six (including two suicides), malathion two. Other reports described conditions such as shortness of breath, hallucinations and nausea. The FDA declined to make a scientist or an administrator available for an interview. In a written response to questions from iWatch News , spokeswoman Shelly L. Burgess said the agency monitors adverse reactions to products. In some cases, health problems have been immediate and stark. Tim Davis, an Alabama lawyer, sued a lindane manufacturer, pharmacist and doctor after a six-month-old child, Jared Gardner, died following application of a lindane cream to treat scabies. According to court documents, an autopsy cited lindane toxicity as the cause of Jared’s death in October 2001. The Science Dr. Barbara Frankowski, a Vermont pediatrician who co-wrote a review of head lice treatments for the American Academy of Pediatrics, said that there have been few documented cases of problems with head lice shampoos. “When you think about it, you get more pesticides eating your salad than you bought at the grocery store if you don’t wash everything well,” she said. “Who knows what kind of pesticides we’re [being exposed to] every day?” She added that many parents treat their children for head lice when they don’t have an active case – unnecessarily exposing them to pesticides. special kind of risk. Children are generally more susceptible than adults to chemicals, these experts say, and the application of a product directly to a child’s head – where only a thin layer of skin protects the developing brain -- seems particularly foolish. Lindane has a particularly troubling history. However, Goldman said she believes permethrin and malathion are relatively safe. The Solution Head lice experts say one of the hardest things about the bug is that many children are treated for head lice when they don’t actually have any. Further, “natural” solutions such as mayonnaise or tea tree oil can be ineffective. Tea tree oil, for example, can be used in excess and cause illness, Frankowski said. “From the pediatricians’ point of view … we make sure ‘Does your child really have an active case of head lice?’ Frankowski asked. “If not, they really shouldn’t be using the [pesticide-based] products.” She also reminds parents not to reuse them outside of the time limits the American Academy of Pediatrics recommends. But many “natural” advocates say the best approach is to pick the lice and their eggs out, one by buy one. Many schools have a “no-nit” policy so kids can’t go back to school with a single nit (egg) in their hair, an often harrowing proposition for parents.